Miami is home to some of the largest colleges and universities in the state of Florida. Touring colleges is a big event for many people entering a new stage in their lives, but coordinating group travel to different colleges doesn’t have to be stressful. Hit a couple of South Florida’s campuses and enjoy the surrounding area in your own personal charter bus. Touring colleges and universities with a group of peers, friends, or an academic organization offers a good chance to have fun exploring future possibilities. Falcon Charter Bus specializes in providing easy and efficient transportation options for all types of groups, including businesses, family travel, and sports teams. If you’re planning to tour University of Miami (UM), Florida International University (FIU), or other colleges, a private charter bus or minibus is the best option for reliable and safe group travel. If your college tour group wants to visit schools throughout the Southeast, Falcon has you covered with long-distance travel options through Tallahassee, Orlando, Tampa, and beyond. College tours don’t have to be strictly business, especially in a city as fun as Miami! Where should you go to eat near campus? What else is there to see in the area? We’ve developed a sample itinerary for future college students in Miami to utilize when touring campuses in South Florida. If your group is traveling from another city or from out of state, book a hotel far in advance, as spaces can fill up quickly during vacation season. These hotels are relatively close to Miami International Airport, Florida International University, and the University of Miami. Hotel Colonnade is located centrally in Coral Gables, close to premier shopping and restaurants on Miracle Mile. A 4-star hotel is a good option for groups who may want a more upscale hotel that won’t completely break the bank. Perfect for customers looking for a familiar mid-range hotel during their travels, Hilton Garden Inn’s Dolphin Mall location is steps away from huge shopping centers, the airport, and FIU. Wingate by Wyndham offers a slightly more budget-friendly option for large groups needing multiple rooms. The location is close to the airport and under 20 minutes from universities. Scheduling tours at each school is the first step in planning your pre-collegiate time in Miami. Most undergraduate information sessions and tours are best to schedule in the morning. This will give you more time during the afternoon to independently explore the campus and explore the city afterward. With a private charter rental, getting around to each location is a breeze. You won’t have to worry about the stress of driving in Miami traffic either, as your professional driver is there to handle the roads while you rest on the bus and enjoy comfortable amenities. Schedule a tour with Florida International University’s Modesto A. Maidique Campus for the morning. These tours usually take about two hours and smaller groups (7 and under) have the option to take specialized tours of different programs like business, engineering, and nursing. Your driver can bus everyone from a designated meeting spot if your group is local, or arrangements can easily be made to have out-of-town groups shuttled from the airport and hotels to the FIU main campus. While on the FIU campus, be sure to checkout the Frost Art Museum and the diverse roster of exhibitions. Then, if you want a taste of The Everglades, the FIU Nature Preserve is a small representation of South Florida’s flora and fauna. After getting a feel of the campus, head over to the Sweetwater location of Miami-born eatery Pinecrest Bakeryfor some authentic Cuban lunch. 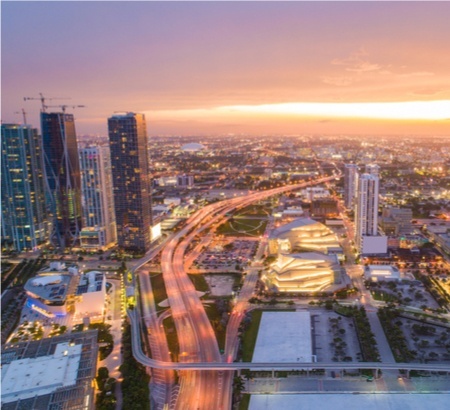 Once everyone’s had their fill of food, it’s time to hop back on the charter bus to explore some other spots in Miami. With expansive gardens showcasing tropical plants, Fairchild Tropical Botanic Garden is a gem in South Florida. It is a must-see attraction for anyone making a visit to Miami and is perfect for groups to do self-guided tours at your own leisure. The gardens require quite a bit of walking and exploration, so it’ll be refreshing to be able to relax on a charter bus after all the tour walks. The afternoon and evening can be rounded out with dinner at Whisk, a local favorite in South Miami. With over 55,000 students currently enrolled, FIU is one of the largest public universities in the south and continuously ranks among top public universities in Florida. Pinecrest Bakery is a Miami-native born and bred eatery specializing in Cuban food and delectable pastries. The botanical gardens focus heavily on international education and conservation of tropical plants, offering the South Florida region sprawling gardens filled with a wealth of knowledge and beauty. With a bit of Southern influence, Whisk has become a staple in Miami for tasty, high-quality comfort food. Large group tours for the University of Miami must be scheduled at least 10 days in advance. We would recommend booking the tour as soon as you receive a full headcount of individuals on the charter bus. Touring the campus in the morning will give your group plenty of time to check out the beautiful campus on your own after the hour and a half guided tour. Along with the academic buildings, be sure to hit the Lowe Art Museum, Shalala Student Center and the beautiful Cobb Fountain. After the tour, your group can cool off at the Venetian Pool, the largest municipal pool in the states, famous for its glamorous architecture and status as a National Historic Place. Havana Harry’s is a highly recommended restaurant nearby for lunch to enjoy with your group. Once lunch is done, bus on back to your hotel for a breather before heading up to The Wynwood Walls to enjoy a group evening filled with art and music in one of Miami’s most creative neighborhoods. As one of the most prestigious private universities in the south, UM has become an iconic representation for academics, sports, and collegiate culture in Miami. The Venetian Pool is hailed for its size and beautiful architecture. Interestingly enough, it is the only public pool currently sitting on the National Register of Historic Places. This cuban restaurant sits in the heart of Coral Gables and is well-known for making customers feel at home with authentic food and ambiance. The Wynwood Walls have brought a new meaning to street art and graffiti in Miami. The Wynwood neighborhood is filled with diverse art, galleries, food and shops. Private individual and group tours are available to guide visitors through the many street art pieces in the area. No matter where your academic travels take you, Falcon Charter Bus has travel solutions to ensure your group arrives to each campus safely and on time. Whether you’re in Miami, Athens, Charlotte or even Nashville for college tours, we’re here 24/7 to help you choose the perfect bus rental for your group’s needs. Give us a call at 305-359-3962 anytime to chat with one of our experienced reservation representatives about your travel to Miami!